For our Texas customers, we’ve added a new report to SimpleCFS™ that simplifies auditing between submitted LTCMIs and the RN signature on the MDS… and even better, can help you avoid OIG audit headaches and take-backs. There’s been a good bit of discussion on this topic in Texas Medicaid circles due to conflicting information coming from various sources. To clarify: HHSC-OIG nurse reviewers will invalidate LTCMIs if the RN information in section S4 does not match the RN who signed on Z0500A of the corresponding MDS assessment per 15 TAC §371.214(c). This will cause a recoupment of all Medicaid payment for which the LTCMI was effective. 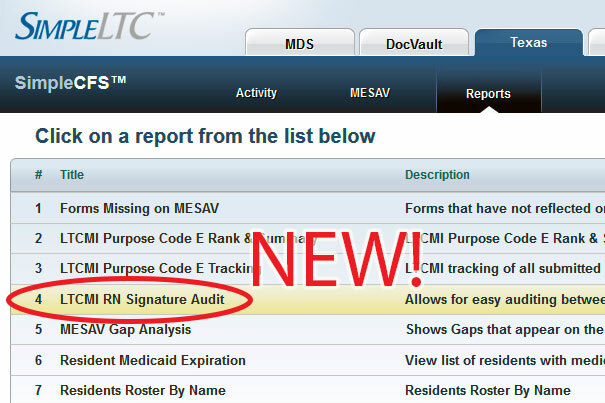 The new LTCMI RN Signature Audit Report (available under the Reports section on the Texas tab) allows you to quickly compare the RN signature information to ensure that LTCMI and MDS fields are in synch. Specifically, the report contains information from a facility’s LTCMIs (DLN, S4 fields, etc.) and the corresponding MDS assessment (assessment type, target date, RN signature date) that facilities can use (along with the signed copy of the MDS assessment) to verify that the information in the LTCMI section S4 matches the RN who signed on the MDS. As is often the case, this helpful addition was suggested by a customer. We appreciate how customers help us continue to improve SimpleCFS.